We offer real Leather Accessories. Nickel and brass hardware is available (where applicable). Other colors and different leathers may be available upon request. All of our accessories are made to order. Please expect up to a 2% over run on all embossed products. 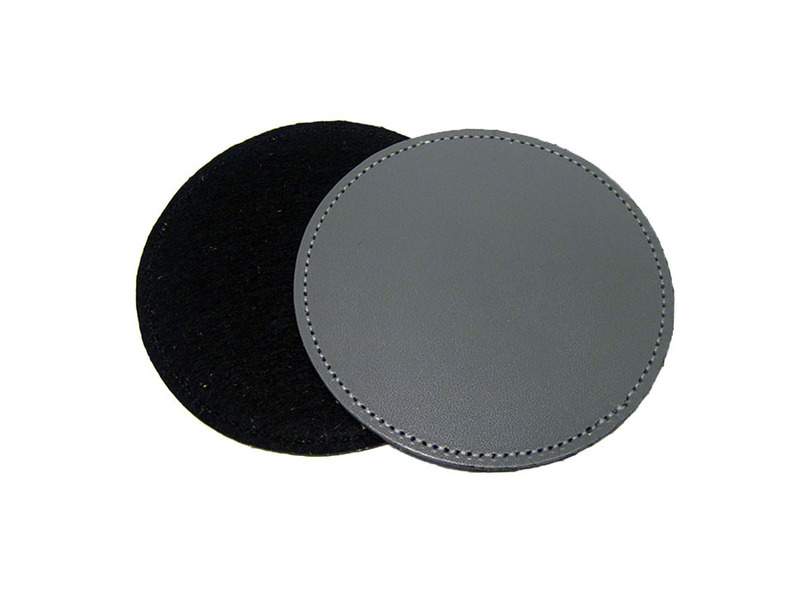 4” diameter – This is our round coaster that is stitched around with black or brown felt on the bottom. We use bonded leathers for our coasters. This makes the product water resister and has a longer life. Colors: black, tan, red, royal blue, baby blue, baby pink, purple, grey, chocolate, burgundy, neon yellow, neon green, neon pink, neon orange; made to order. 4” x 4” – This is our square coaster with rounded corners that is stitched around with black or brown felt on the bottom. 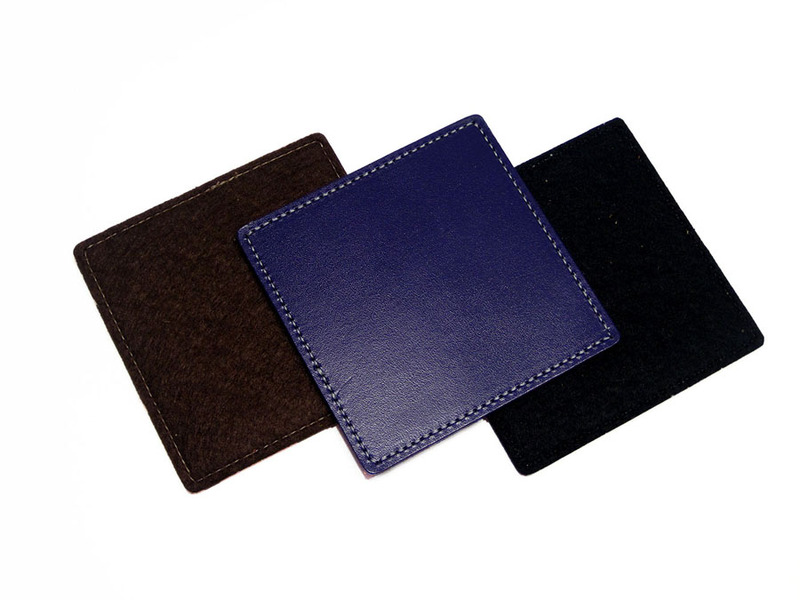 We use bonded leathers for our coasters. This makes the product water resister and has a longer life. Colors: black, tan, red, royal blue, baby blue, baby pink, purple, grey, chocolate, burgundy, neon yellow, neon green, neon pink, neon orange; made to order. 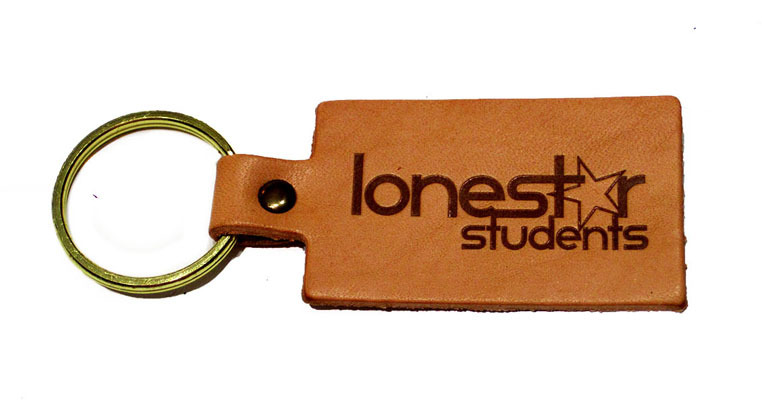 2 ¾” x 7/8” – This style key fob is back by popular demand! It is a rectangular key fob with rounded ends. It has a 1 ¾” leather piece with a rivet connecting the key fob to the key ring. Colors: black, natural, chocolate, tan; made to order. Size:1 ¼” x 2 ½” – This is our small, two sided rectangular key fob. It is stitched around and comes with a key ring. Colors: black, natural, chocolate, tan; made to order. Size: 1 1/8” x 2 ½” – This is our large, two sided rectangular key fob. It is stitched around and comes with a key ring. Colors: black, natural, chocolate, tan; made to order. 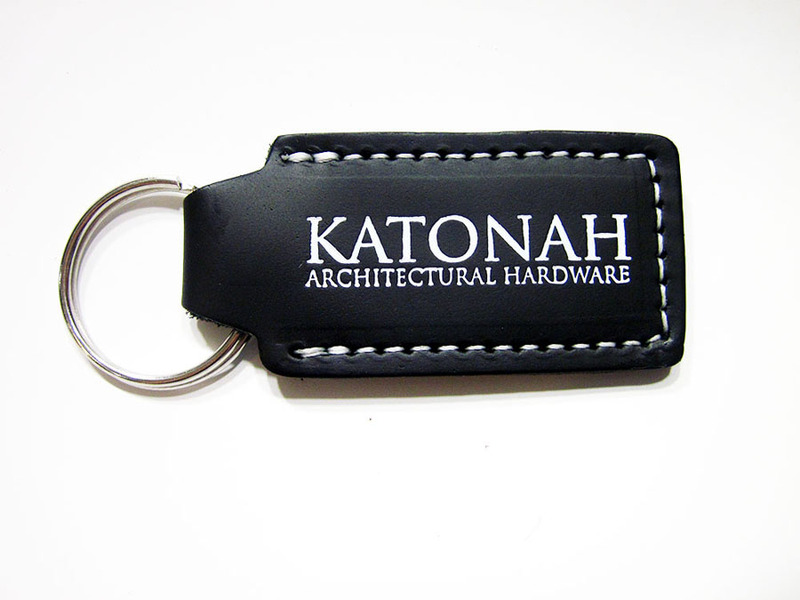 Size:1 ½” x 1 3/8” – This is our one sided rectangular key chain with rivet, jump ring and key ring. Colors: black and natural; made to order. 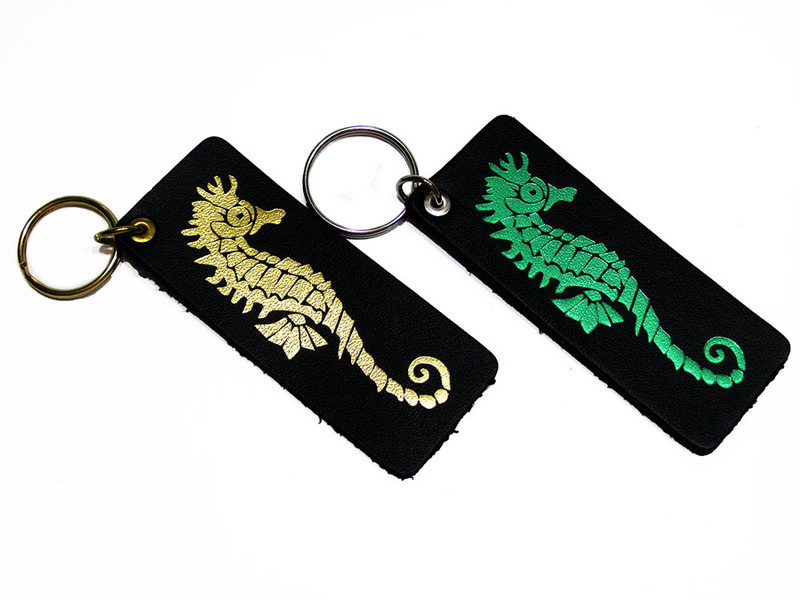 Size: 1 ½” x 1 7/16” – This is our wrangler style key chain. It is one sided and comes with a key ring and rivet. Colors: black and natural; made to order. 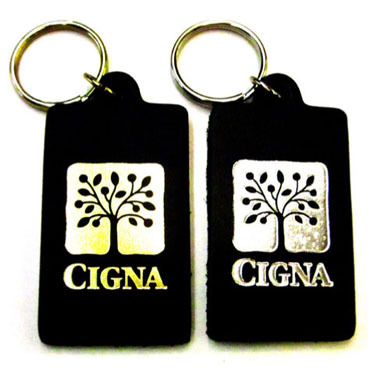 Size: 1 ½” x 1 7/8” – This is one of our original key fobs. This ice box style key chain is rectangular in shape and comes with a key ring and jump ring. Colors: black and natural; made to order. Size: 1 ½” x 8 ¾” – This is one of our newer bookmarks. It is our narrow basic bookmark with a ridges edge. Because it is skinny, it give the appearance of looking longer. Colors: black, tan, red, royal blue, purple, grey, chocolate, burgundy, navy, dark green; made to order. Size: 1 ½” x 8 ¾” – This is one of our newer bookmarks. It is our narrow basic bookmark. Because it is skinny, it give the appearance of looking longer. Colors: black, tan, red, royal blue, purple, grey, chocolate, burgundy, navy, dark green; made to order. 3/4” x 12” – This is one our newest bookmarks. At 12”, it is our longest bookmark. This sleek and elegant bookmark has angled edges. 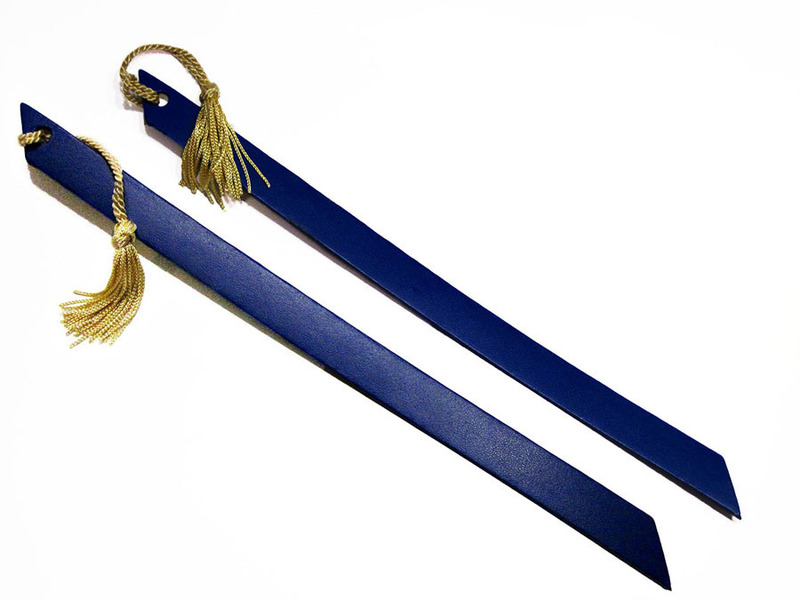 It is available with or without the tassel. We currently have red, white and gold, or gold tassels available. Other color tassels are available for large quantities. Colors: black, tan, red, royal blue, purple, grey, chocolate, burgundy, navy, dark green; made to order. 1 ¾” x 8 ¾” – We have many different style book marks. This one has a fringe edge. Colors: black, tan, red, royal blue, purple, grey, chocolate, burgundy, navy, dark green; made to order. Size: 1 ¾” x 8 ¾” – We have many different style book marks. This one has an edge that mimics a ribbon. This is one of our first bookmarks. Colors: black, tan, red, royal blue, purple, grey, chocolate, burgundy, navy, dark green; made to order. 1 ¾” x 8 ¾” – We have many different style book marks. This one has an edge that looks like a wave. This is one of our first bookmarks. Colors: black, tan, red, royal blue, purple, grey, chocolate, burgundy, navy; made to order.